Get A FREE Brochure from "Freedom Paradise Resort"
This resort is perfect for people who truly like to relax and enjoy a Mexican Caribbean experience. 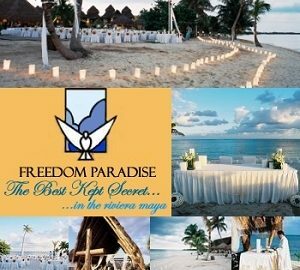 In Freedom Paradise your honeymoon or wedding becomes a real treat! We offer personalized service and a familiar atmosphere that will allow you to have a truly enjoyable wedding or honeymoon. Freedom Paradise is an all-inclusive resort, which will save you money and allow you to enjoy the real flavor of Mexico. We have several honeymoon or wedding options from which to choose. Visit our website or give us a call to learn more. Your room is located at only a few paces away from the sparkling Caribbean Sea. If you are planning a quite honeymoon or wedding away from the hustle and worries of the real world, this is where you want to be. Please mention this ad when you contact Freedom Paradise!